You may have heard of such internet marketing terms such as search engine optimization, pay per click, and social media marketing, and are wondering, “What is the best online media avenue for my business?” Let’s dive into these online marketing types and discuss the advantages and disadvantages of each, and from there you may be able to determine the best and most effective marketing approach for your organization based on your desired outcome and budget. As with any product or service in life that you may want to buy, you must first determine what you can or are willing to spend on it. Since there are different levels of engagement with each, your budget is a direct reflection of what you can expect. With that in mind, let’s break down some of the most popular internet marketing acronyms out there and attempt to demystify some of these online advertising venues. Explanation: When someone types in a word in Google, e.g. “search engine marketing”, your website comes up in the search results. 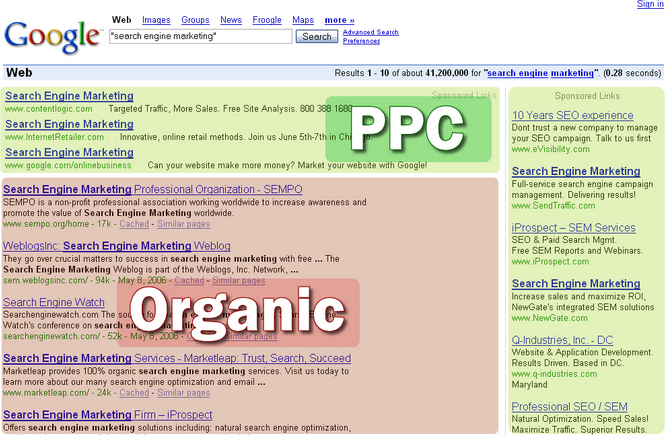 Roughly 85% of people who type in that word click on the “organic” results over the PPC results. The difference between local SEO, SEO, or Enterprise SEO is reflected in the geographic areas and number of keywords for which a business wants to rank. Advantages: Knowing that 85% of the audience that search for that keyword will click on the organic results, SEO draws the largest audience size. Therefore, ranking for keywords has the highest value to whoever ranks on the 1st page of Google. Also, you do not have to pay every time a person clicks on your website as in the PPC model below. Disadvantage: Organic rankings take time, usually 6 months to a year or more of constant work on adding content to your website and, depending on who ranks for that keyword now, you may not be able to outwork or outspend companies that are on the 1st page now. You need an SEO expert to help you determine the risk vs. reward on trying to rank for a keyword for your business. Many times you can increase sales or leads and traffic by not even increasing rankings on the keywords. Explanation: When someone types in a word in Google, e.g. “search engine marketing” your website comes up in the search results highlighted in a light pink or yellow at the very top or on the right side of the page. 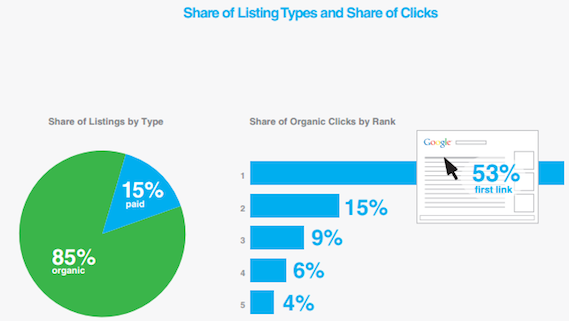 Roughly 15% of people who type in that word click on the PPC results over the organic results. Unlike SEO, which has division according to local and enterprise SEO, there is no difference in the approach or tactics of PPC, merely the adspend budget. Advantages: If your ad is written well, your website is relevant to the ad you wrote, and the page they land on has an easy to understand call to action, you have a very high likelihood of showing up higher in the PPC section. Disadvantages: Statistically 85% of people click on organic results. That leaves only 15% of the audience left that will click on a PPC ad. So, the audience size is smaller than organic SEO results might get you. Also, you must “pay per click”, meaning every time someone clicks on your ad you must pay Google whatever they are charging for that keyword at that time. I can best describe this as an ad auction. Since this can get quite complicated, here is a video from Google explaining it. Explanation: There are several Social Media avenues, and, with all of them changing in popularity as often as the trendiest clubs do, it’s hard to keep up. As of 1-28-13, the date I am writing this article, the most popular social media sites in the US may surprise you. According to the latest statistics the top 5 Social Media Channels in the US are as follows. Advantages: If you are able to understand the top 5 social media platforms, the mood of each of them, and deliver a timely and relevant message to the right audience, it can pay huge dividends. The key is having the right content delivered at the right time, on the right channel. This is not much different than traditional TV commercials; however, keep in mind that the demographics and statistics are able to be tracked better now. Also, because of the power of networks and exponential math, if your content is shared, your message can spread very quickly, and, before you know, it you may have several hits on your YouTube channel, website, or landing page. Done properly, social media marketing can provide you a very strong ROI. Disadvantages: This can be a risky form of advertising if you deliver the wrong message to the wrong audience. People who feel like it was a selfish message or pushy style can belittle your tactics very publicly if you’re not careful, and you can do more damage than good. Imagine having a super bowl commercial that totally flopped and a public forum for people to voice their opinions about it. In summary, there are different reasons and expectations for each channel of online advertising and it takes a trained and experienced online marketing professional who understands the subtleties of each to brainstorm, plan, implement, execute, track and repeat the process in the most successful way. 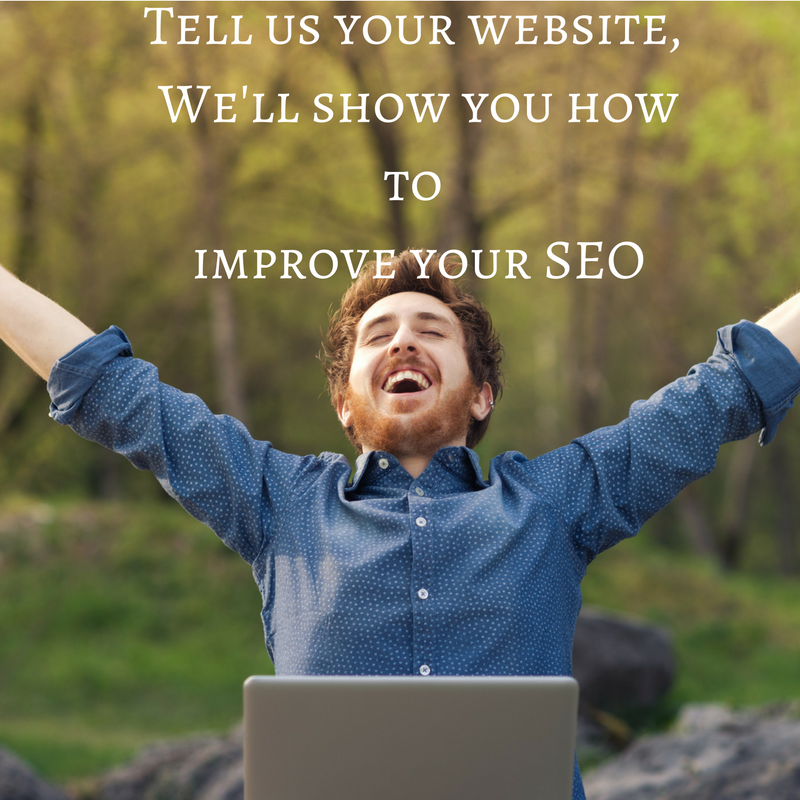 If you’d like to discuss whether local SEO, SEO, enterprise SEO, PPC, or SMM is right for you and your business, please reach out and we’ll discuss the recipe to achieve and exceed your growth goals.